I continue to be amazed at how rich my life is because of the people around me. I understand the importance of being plugged into people who are seeking to become better human beings. 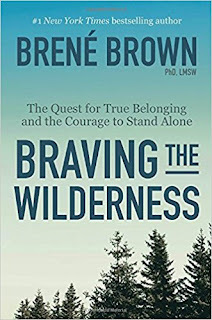 A couple of different groups I hang with are studying Brene' Brown's book, Braving The Wilderness. 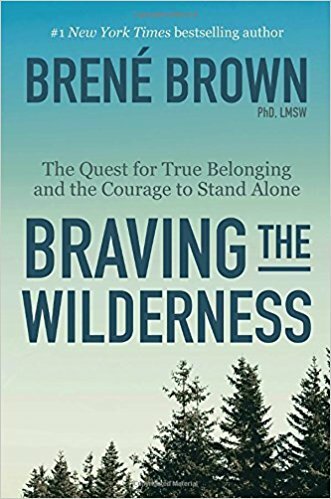 Brene is a research professor who specializes in studying the human condition in the form of empathy, shame and vulnerability. The guys at my Thursday coffee group are discussing it, one chapter at a time. Another of the groups is called "Jesus and Wine" and it meets monthly to discuss books on faith, spirituality and the human condition. As is the case with this book, it doesn't have to be a Christian-centric book, but because often times faith in a higher power and the health of our culture/humanity are interconnected, these books fit inside a faith based study - in my opinion, anyways. This Jesus and Wine group met this past Tuesday and the discussion was fantastic. I was convinced to go by my wife and am glad I did.I am only about 1/2 way through the book and am hooked. My wife tends to shove books at me when they've been deemed "really good" by her, and she reads a lot of books, so I trust her judgment. The underlying premise is that loneliness is a state that many people find themselves in, but that loneliness and being alone are two different things. Without getting bogged down in details, because I'll probably get them wrong anyway, I'll leave it at saying "read the book" because at this point I am hooked. The biggest question it asks early on is about "fitting in." Did you ever feel like you didn't fit in? With family, or friends, or colleagues or, or, or...? And I got to thinking of a few times I didn't fit. The first was as a new student in 4th grade. We had just changed schools and, other than my siblings, I didn't know anyone at the new school. Making a switch to a new school is hard for anyone, but when they are as shy as I was, the difficulty is magnified even more. I remember the first kid who befriended me was Ron Corazzo. We were playground outcasts, but somewhere along the first month of school, he reached out. He introduced me to Ralph Kishel and I started fitting in one person at a time after that. Still, some lonely days leading up to it. Another that I'd almost forgotten was when I was a freshman in high school. Again, new school, this time with more familiar people than last, but still new surroundings. My sister tells the story that when she was going out one Friday night, I said to her "I wish I had as many friends as you." She said she felt terrible, but only for a second as she skipped out the door. By senior year, I had a well established circle of about 5 really close friends, so it didn't last forever, but a crappy, lonely feeling nonetheless. I guess the last time I really felt out of place, or left out was, oddly enough, in a Bible study group. Over about a 4 year period, the group went politically rogue to the point where it was apparent that I was the only "liberal" (as much as I hate that word) thinker in the group. After a while, I was on an island in my thinking and so left the group. I probably should have stuck it out, but sometimes the answer to being a lone wolf, is to leave the pack. In my opinion, politics and religion shouldn't mix, but they did and broad based assumptions were made, so I put an end to that the easiest way I knew. "You are only free when you belong no place - you belong every place - no place at all. The price is high. The reward is great." As confusing as this quote is, it has great depth, and from what I've read so far, she is planning on laying out a plan for better connection with the world and with ourselves as the book goes on.